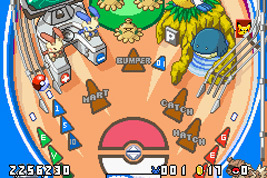 The sequel to Pokémon Pinball features two all-new tables based on Pokémon Ruby & Sapphire. Use the flippers to keep the Poké Ball in play, scoring points by hitting bumpers and other table features. Triggering certain features will make a Pokémon appear, and you have a limited time to capture it with the Poké Ball. Each table has various "locations" that determine the Pokémon that will appear. You can also find Bonus Tables where you get opportunities to catch rare and legendary Pokémon.